In The Twilight Saga: Breaking Down Part 1, Bella Swan decided to make sacrifice to give birth to the wondrously growing baby, which cannot be defined for its species. Through this movie, we can clearly watch how Bella become extremely skinny and senescent from a beautiful and fresh girl. If you want to know what the result of Bella is (whether she has been turned to a Vampire by Edward), you can buy the genuine DVD of Breaking Down. And I'm glad to tell you that DVD is more than a one-off thing or experience. You can back up DVD The Twilight Saga: Breaking Down Part 1 to prevent it from loss or damage, appreciate it some years later, send it to your friends, and so on. 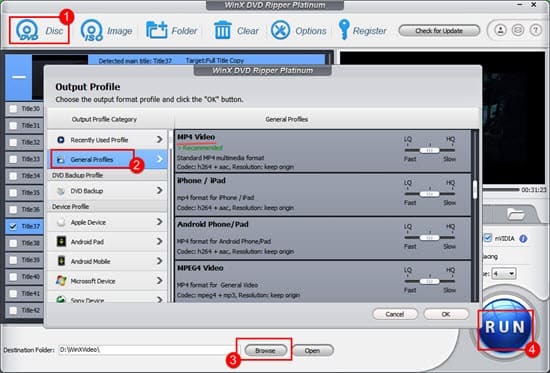 WinX DVD Ripper Platinum is able to help you rip Twilight Saga: Breaking Down Part 1 DVD to MP4/MPEG(2)/WMV/MOV/FLV/3GP, or clone DVD to ISO image, backup Twilight Saga DVD and make it playable on all apple devices (iPhone, iPad, iPod, Apple TV), Android HTC, Samsung, Galaxy tab, Sony PSP, Amazon Kindle Fire, Lenovo, Huawei, Acer, etc. Rip and copy The Twilight Saga: Breaking Down Part 1 DVD to AVI – Play it on most Windows players and mainstream media players, such as Windows Media Player. Rip and copy The Twilight Saga: Breaking Down Part 1 DVD to MP4/MPEG4 – Get small file size but high video quality. Since MP4 is widely accepted by many platforms, you can play it on iTunes, iPods, iPhones, iPads (all versions), 5KPlayer, The KMPlayer, Media Player Classic, MPlayer, QuickTime Player, VLC, Windows Media Player, etc. Rip and copy The Twilight Saga: Breaking Down Part 1 DVD to MPEG2 – copy DVD main title/main content to MPEG 2 file with either single or multiple audio/subtitle tracks in only 5 minutes. Play The Twilight Saga: Breaking Down Part 1 on PC, PS3, Xbox, Media Center, etc. Rip and copy The Twilight Saga: Breaking Down Part 1 DVD to WMV – play it freely with on Windows OS PC, specifically with such as VLC, The KMPlayer, Mplayer, etc. Edit the converted Twilight Saga video on Windows Movie Maker. Rip and copy The Twilight Saga: Breaking Down Part 1 DVD to FLV – Play it with Adobe Flash Player (The audio and video data within FLV files are encoded in the same way as they are within SWF files), edit and upload FLV video to online video websites such as YouTube, Hulu, Google Video, Yahoo Video, Metacafe and Reuters. Rip and copy The Twilight Saga: Breaking Down Part 1 DVD to 3GP – Play the converted The Twilight Saga: Breaking Down Part 1 DVD video on mobile phones. Download DVD Ripper Software or PC or download DVD Ripper for Mac. Install the software and run it on Windows. 1. Insert DVD The Twilight Saga: Breaking Down Part 1 to the computer. 2. Click "DVD Disc" to import the DVD movie. Note: This Twilight Saga: Breaking Down Part 1 DVD ripper also supports ISO image and DVD folder as the source. 3. Choose a common video format or preset device profile you need. You can refer to the use of each format listed above in the article. 4. Hit "RUN" to start ripping DVD The Twilight Saga: Breaking Down Part 1. Rip DVD movies to digital formats like MP4, AVI, MPEG, WMV, MOV, FLV, M2TS, MP3 etc., or backup DVD to ISO image. By easily unlocking copy protection mechanisms, it makes whatever types of DVDs playable on iPhone, iPod, iPad, Android, etc. Arlene Cooper is a self-motivated copywriter and editor in Digiarty Software, specializing in writing, proofreading and digging out inscrutable technology knowledge. Thor: Ragnarok DVD will be released on March 6, 2018. Here are the tips of how to rip Thor: Ragnarok DVD to MP4, AVI, iPhone X/8, PC hard drive, macOS, etc. If you plan to purchase a DVD of Black Panther, you're suggested to rip a digital copy off it for playing on iPhone, Android, or other devices, or for saving or hard drive. Get to know how to free rip DVD to USB 3.1/3.0/2.0, USB Type-c flash drive on computer, transfer DVD to digital file (in MP4/AVI etc.) for storing on a USB drive.